What is an outdoor ESCAPE ROOM? As a team, you are equipped with an iPad that guides you to GPS-triggered challenges in form of questions, tracks, video and image missions. Here it is important to work together efficiently, think creatively and be innovative in order to complete the missions. Updates, feedback and scores are kept in real time as your teams can follow during the mission. For several of our GPS team building activities, participants get an “action pack” with remedies they need to use to solve the missions, that they find moving between the different locations. Outdoor escape games with GPS challenges are known for their ability to promote wider communication, where everyone can contribute with input and contribute to the common goal. Our outdoor escape games take the teams out of the normal work life and encourage you to take on new challenges away from the normal routine. The challenges ensure that participants develop problem-solving skills. The teams learn that making mistakes is a part of being successful and where you have to be flexible and creative in order to optimize the collaboration in the company. Contact us for an offer. Click “here” for the contact form. An evil illuminated based syndicate has developed a virus that infects the brain, giving them the full control over the victim’s mind. They can use you or anybody anywhere to control your behaviour and create chaos. The organization has a secret research centre in Copenhagen and they are about to trigger the ultimate weapon: your mind. Will your team be able to find the clues that are hidden in the city, stop the activation of the virus? Equipped with an iPad and a special designed actionpack you will experience a completely new team adventure. Teams of 5 – max. 64 players. 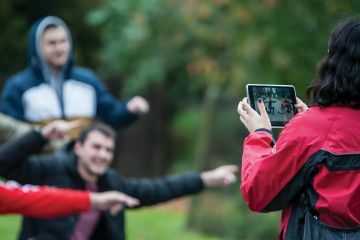 Teams navigate a ‘real world’ adventure trail to escape a ‘virtual world’ mirrored on their tablet interface with GPS triggered checkpoints. Armed with and an ‘Action Pack’ full of vital gadgets and gizmos, participants must cipher their way through a number of game sectors and virtual checkpoints. Each sector is deviously designed to test team dynamics and challenge participants ability to communicate effectively on the run. The answers and choices that teams make open secret alternative routes with ‘short cuts’ for the astute and ‘dastardly diversions’ for those not so lucky!. Problem solving is just the start, the team will need to work closely together highlighting team work, making decisions under pressure, trust, leadership, and learning from experience. 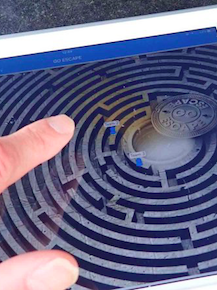 Escape the Maze can be run as a competitive exercise where accountability, communication and time management are key. For a collaborative learning outcome, teams can approach the sectors at the same time, sharing their learning from success and failure as they progress by using the in-app messaging. In both cases teams need to work together at the end to save themselves. As a team, you are provided with tablets that guide you to GPS-triggered challenges; questions, tracks, video and image missions. It is important to work together efficiently, think creatively and be innovative in order to complete the missions. Updates, feedback and scores are kept in real time as your teams can follow during the mission. 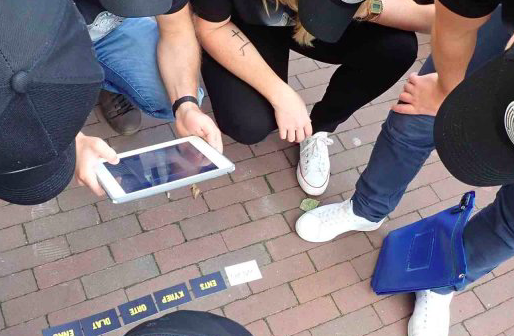 Outdoor escape games with GPS challenges are known for their ability to promote wider communication, where anyone can contribute input and express their ideas. 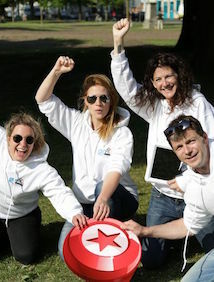 Our outdoor escape games take the teams out of the normal roles and encourage you to take on new challenges away from the normal work routine. The challenges ensure that participants develop problem-solving skills. The teams learn that failure can lead to success and where to think creatively to optimize the normal work process.